Howard Y. F. Choy. 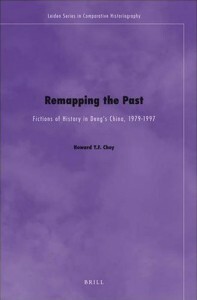 Remapping the Past: Fictions of History in Deng’s China, 1979-1997. Leiden: Brill, 2008. pp. 278. ISBN: 978-90-04-16704-9. Howard Choy’s Remapping the Past sets out to examine and critique the intricate and important links between history and fiction in the novels and short stories produced in the last two decades of the twentieth century in China. Although beginning in the late Qing period fiction had begun to compete with it in the literary hierarchy, for millennia history had been among the most exalted of literary and narrative forms in China. The interactions between past and present and the ways that Chinese narrative–history as well as fiction–gives form to those interactions are central to our understanding of the functions of narrative. And yet this interaction has been relatively understudied, especially in the English language scholarship. In addition to addressing this gap in the scholarly literature, Remapping the Past makes another important intervention by shifting our focus away from the temporality of the past or present and instead drawing our attention to its location. With this understanding of history, Choy then delves into its creation in the fiction produced in the Deng Xiaoping era. He divides his text into four broad studies, the cardinal points of his historical cartography, if you will, that transect and traverse his exploration of these fictions of history. Chapter 1, “Regional Romances and Family Fables: From Root Search to New Historicism,” mainly focuses on the works of Han Shaogong and Mo Yan. Here Choy argues that the antiheroic characters in the works of these two authors (such as Han’s Young Bing), in conjunction with non-linear and fragmented narratives (such as in Dictionary of Maqiao or Red Sorghum Family), as well as the inclusion of low literary modes (especially parody of official language), in these narratives all serve to subvert official party-sponsored revolutionary historical modes. This rejection of CCP discursive practices, in turn, helps decouple these regional narratives from national allegorical interpretations and allow them to signify on personal and local levels. In Chapter 2, “The Outlying and the Peripheral: Myths of Migrants and Minorities,” Choy uses Wang Anyi’s Patrilineal and Matrilineal Myths, Zhang Chengzhi’s stories of the Hui in northwestern China, and Tibetan stories by Tashi Dawa and others to mark the mythic and phantasmagoric origins of “Chinese” culture. These narratives reveal repressed (by national, revolutionary, market, or party concerns) histories that suggest “unstable plural origin[s]” (76) and the displacement of ethnic differences. Above all, for Choy, these narratives disclose the arbitrary and fictional nature of history as narrative constructed for distinct purposes rather than to transparently record events. Chapter 3, “From the Country to the City: Nostalgia for the Hometown,” examines nostalgic themes of home developed in the fiction of this period. Here Su Tong’s Maple Village, Wang Shuo’s Beijing, and Wang Anyi’s Shanghai are the principal examples. Choy argues that, under Mao, the city had been neglected in favor of rural subjects for literature, but that in the Deng there is a return to urban narratives. Here, as in the myths told about marginal and ethnic histories discussed in chapter 2, Choy’s nostalgia depicts not the past but fabrications of the past. The “outsider position” (184) enabled in these narratives of the city provide an alternate historical viewpoint from which to (re)view revolutionary narrative of the countryside. Chapter 4, “The Bodily Text and the Textual Body: The Violence of History,” as its title indicates, focuses on the violence of historical representation and the representation of historical violence. Here works by Mo Yan, Su Tong, Liu Heng, Ge Fei, and Yu Hua serve as examples of different varieties of textual and bodily violence where “the human body is rediscovered as the space of historical violence” (226). Finally, in the Conclusion, “Back(ward) to the Future: Toward a Retro-Fiction,” Benjamin’s image of the angel of history–back turned to the future and ever gazing in horror on the past in ruins–is deployed to figure the role the texts studied in Remapping the Past play. The ruined past is displayed in these texts as evidence of and protest against the violence suffered in the name of party sanctioned progress, whether that progress is driven by revolutionary or market forces. In addition, Choy includes an Appendix, “What is Held and in Whose Hand? An Etymological Reexamination of Shi.” Here, to buttress his notion of violence underlying history, Choy argues that shi, the term that has come to indicate history or historian, has roots in a military office. There is much to recommend itself in Choy’s study. The close readings he offers of a broad range of contemporary Chinese texts are erudite and insightful. The wide citation of Chinese secondary sources is especially valuable (and regrettably rare) in English studies of this sort. Chapter 4’s discussion of the violence underlying historical narrative is, to this reader’s mind, particularly effective in both elucidating the violence under consideration and linking it to Choy’s notion of spatialized history; the previous chapters do not always establish this relationship between text and cartography as strongly as in the fourth chapter. wishes to delineate that transgression. How is it that a study of fictional works can concern itself with historiography? Isn’t the first tenet of any historiography to relate only what actually occurred; whereas fiction, by definition, does not restrict itself to the actual? Choy explains and justifies this in terms of engagement with a postmodern discourse of “metahistory” (4). Surely we can agree that language and narrative play determining–but not controlling–roles in the construction of history. But, when “the mere matters of fact and truth” can be so easily dismissed, there can be no distinction between history and fiction. The texts studied by Choy can and do tell us much about the limitations of official historical discourses: the aphasia, amnesia, and violence Choy mentions in the passage cited above. Yet, it seems to me, that setting up this sort of equivalency between history and fiction only serves to muddle the matter further. The use, in the Conclusion, of Benjamin’s angel of history and his notion of history as the piecing together of a past in ruins helps to mitigate the effects of this problem, but for this reader it came too late to be of much use. Furthermore, this conflation of history and fiction is paralleled by a conflation of author and narrator. While we can see how Choy’s de-emphasis of the fictionality of the texts for the sake of promoting their historicity could lead logically to an analytical neglect of the (fictional) narrator in favor of the (historical) authorial voice, it is not clear if there is a direct relationship between these conflations. Indeed, it must be said that this problem is not consistently present in Remapping the Past; that is to say, some texts lend themselves to this conflation more than others.. For example, since Wang Anyi draws on her own family histories in Patrilineal and Matrilineal Myths, it is quite easy to assume that the narrator of these stories is Wang herself. Yet, it seems to me, that if we are to take these narratives seriously as fiction then what we cannot do is precisely assume the narrator is the author herself. This is a problem that seems to be particularly prevalent in the field of Chinese literary studies; by no means is Choy alone here, and indeed, I am sure I have been guilty of this as well. Nevertheless, as with the issue of history and fiction, rather than clarifying the argument, this conflation of author and narrator only serves to hinder analysis. Finally, the Appendix, while clearly well researched, seems completely out of place and unnecessary. The etymological mode of inquiry has no bearing on the methodologies employed in the main body of the text. But more important, the conclusion drawn in the Appendix, namely that shi originally indicated a military office whose violence then implicates his later incarnation as historian, has already been argued more forcefully in Chapter 4. I am thankful to Choy for addressing the relationships between history and fiction and between past and present in Remapping the Past. This is an aspect of Chinese literary studies that deserves more attention than it has garnered, and Choy’s book helps us to begin thinking about these questions. At the same time, the problems I have noted above prevent this study from achieving its full potential.